Sometimes an account with limited access in the portal will temporarily require access to additional functionality. For example, a user may need to perform additional tasks while covering for a vacationing administrator, or a project may require temporary, frequent use of a particular administrative function. Temporary account impersonation may also assist while troubleshooting an issue by allowing one user to see the portal as another user sees it. Temporary account impersonation allows a user to access the portal with another user's account, granting the impersonator the permissions associated with that impersonated account. To set up temporary account impersonation, edit the user account to be impersonated, adding the impersonator's account information in the Edit Entity pop-up. In the example, we will allow the impersonator, the user "underwriter@decicsions.com," to impersonate an administrator, the user "admin@decisions.com." As an administrator, add the account to be impersonated to to the Account settings of the impersonating account. Log out as the administrator, and log in with the impersonating account. Click the As. . . link and select the account to impersonate. Access functionality associated with the impersonated account. The impersonating user (underwriter@decisions.com) can access additional functionality while impersonating the administrator account (admin@decisions.com). To begin, navigate to the folder System	> Security > Accounts	. Select the account to be impersonated, in the action menu select Edit Account	. In this case admin@decisions.com	. To save the account impersonation settings, back in theEdit Entit y pop-up, click OK	. The user can now log in as theimpersonating account	and access the functionality associated with theimpersonated account	. On the Login screen, enter the user name and password of the impersonating account. 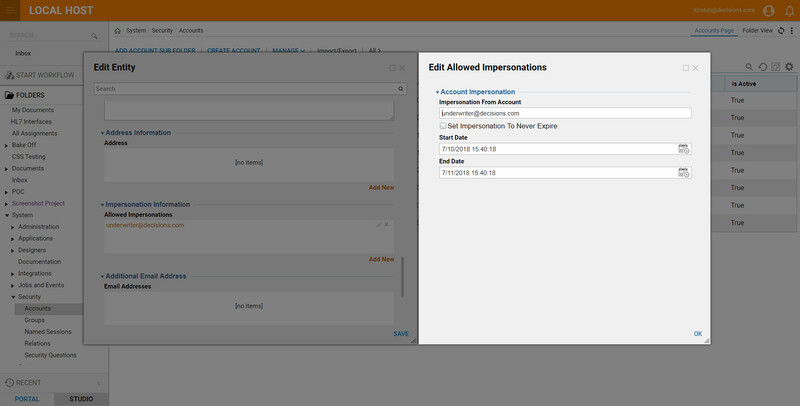 The portal opens with the limited functionality associated with the impersonator's account. However, because this account has been configured to impersonate another account, the Account Impersonation	option displays in the Actions	menu. Select the Login As...	link. Select the user to impersonate and click Impersonate. Full functionality is now available as the limited account.